Alfred Dong was born in China. He is an award-winning filmmaker and visual artist, Alfred was trained at USA, Italy and China. His works reflect the attitude and philosophy of human life in a global context and people's life are dominating by mainstream culture. With broad interests in various disciplines, Alfred Dong intend to use the most basic materials as the carrier of art and to generate ideas from the most ordinary behaviors such as speaking, performing and living. The most ordinary objects or behaviors in daily life thus carry powerful meaning to inspire the viewers to reflect on their own lives, decisions and attitudes which they have faced or will face. Alfred Dong’s films were screened at USA, France and Netherland. His artworks and performance have exhibited at Bienal de Cerveira in Portugal; WRO Media Art Biennale in Poland; Hokkaido Museum of Modern Art, Japan; Moscow Museum of Modern Art; Corcoran Gallery of Art, D.C; White Box, New York; Apexart , New York; Arcade Gallery, Chicago; London, Milan,Istanbul Florence and Athens. 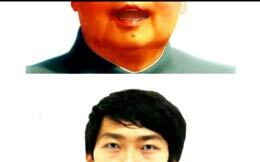 Alfred Dong lives and works in China and USA. A Chinese girl held an IPAD who was standing at Time Square, a major commercial intersection in the borough of Manhattan in New York City. The video was playing via IPAD is cyber-system based and the still image of John F. Kennedy was manipulated, in an animated way and enable him to show vivid, strange facial expressions as classical political speech of 1961 inauguration by him. The total performance is 14 minutes long, as same as video length. The date for performance is December 24, 2010. The two-channel video is the demonstration for the performance, and both documented as living performance and inside section for video. Glocal means glocalisation. 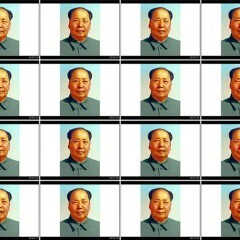 This video project integrates a painting of Chairman Mao Zedong, who is the first Chair of People’s Republic of China, with his speech to responsible cadres of the National Association of Music Workers and some other comrades which held in Beijing at 24 August 1956. As the text of Mao’s speech could be translated by the artist into other languages, audience are able to have living experience through the screen seeing the most important man in China say his words of significance in English. Through animation of the still image, artist investigates in what extend consciousness of human being could be manipulated in a pro human era where a multitude of advanced media and technologies can radically shape and filter an original event or experience. 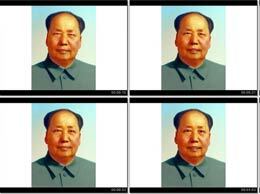 This video project integrates an half painting of Chairman Mao Zedong, who is the first Chair of People’s Republic of China, with his speech to responsible cadres of the National Association of Music Workers and some other comrades which held in Beijing at 24 August 1956. 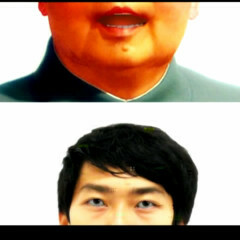 The another half image is found picture of a youth, which was taken from video still. As the text of Mao’s speech could be translated by the artist into other languages, audience are able to have living experience through the screen seeing the most important man in China say his words of significance in English. Through animation of the still image, artist investigates in what extend consciousness of human being could be manipulated in a pro human era where a multitude of advanced media and technologies can radically shape and filter an original event or experience.